They have a ceramic grinding system for extra durability and are fully adjustable for either fine or coarse grinding. The stylish brushed stainless steel finish and curved shape makes them comfortable in the hand and the one button operation makes it easy to use them single-handed. 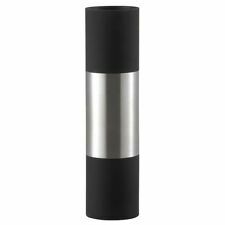 Bodum Twin Dual Salt & Pepper Grinder (Black) Free Shipping! 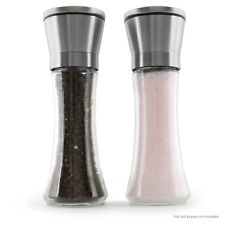 The Bodum twin combo salt and pepper grinder spices up kitchen counters and dinner tables alike. With one easy turn of the colorful silicone band that serves as a non-slip handle, the twin switches between salt and pepper. Norpro’s Adjustable Peppermill is constructed of a heavy-duty metal, with a zinc alloy grinding mechanism. With an adjustable grind from fine to coarse, grinding fresh pepper onto salads, soups, and pasta dishes has never been easier. Hand washing is recommended. Made in Taiwan. 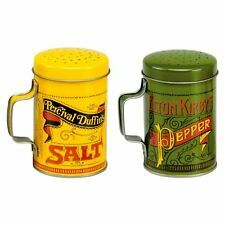 2 Piece Salt and Pepper Shaker Set. Durability ： Equal to glasses on Better than glasses. If the item slip fall, don ’ t worry hands was cut. Stainless steel, Acrylic, and wood. Safety to use! This mini 3″ salt spoon is made from dishwasher safe stainless steel. Spice is the variety of life, but how do you take it with you on an outing? The Salt&Pepper Plus carries three spices in waterproof, airtight and shock resistant compartments. As practical in a forest glade as in the darkness of your briefcase, the Salt&Pepper Plus floats and fits inside the MealKit's SnapBox. Product Specifications: Three refillable compartments. Airtight, shock-resistant, waterproof. Fits inside SnapBox in MealKit. Floats. Material: Box and lid ABS Gasket: TPE rubber material Actual size: 70x70x31mm Weight: 40g. 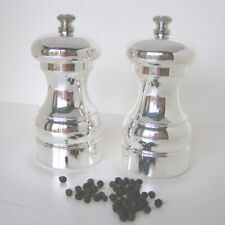 THE PEPPER GRINDER WAS BOTH MADE AND HALLMARKED IN BIRMINGHAM. 1 Red Plastic Ketchup Bottle with Screw Top Lid - Size: 12cm (H) x 4.5cm (D). 1 Wooden Picnic Table with recesses for Bottles and Hole for Parasol - Size: 17cm (W) x 14.5cm (D) x 8cm (H). 1 Yellow Plastic Mustard Bottle with Screw Top Lid - Size: 12cm (H) x 4.5cm (D). 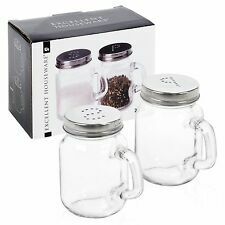 Perfect for picnics, camping, lunchboxes and more, this 2-piece Travel Salt & Pepper Shaker Set features compact containers in a transparent plastic design to shows the contents clearly. Pocket-Size Salt & Pepper Shaker. 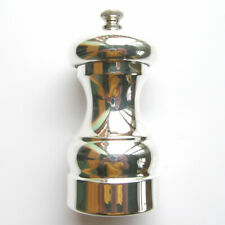 Suitable for milling pepper, corn, mustard seed and other small sized spices. 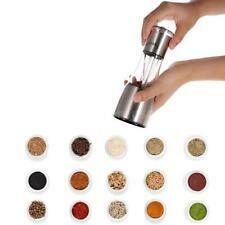 Convenient and efficient to grind pepper, salt and other kinds of spice. 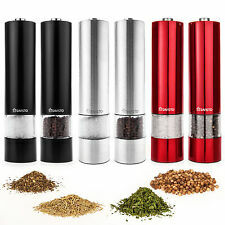 1 x Stainless Steel Pepper Grinder. Press the top to grind pepper in a simple, one-handed operation way. Persian blue salt is a coarse salt studded with sapphire-coloured rock crystals. It is extracted from mines of pure, unpolluted crystallised sea salt which have formed over 260 million years – meaning that that it’s a finishing salt which oozes history and sophistication. Blue Persian salt has a mild taste, which means that it won’t overwhelm delicate flavours. It has a strong coarse texture though, retaining a clean bite. Use the Persian blue salt to add a touch of glamour to rims of cocktail glasses, or sprinkle the salt over white fish or carpaccio. 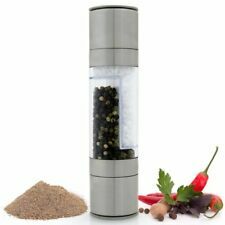 Salt & Pepper Glass Hand Mill Grinder Coloured Pots | FREE Shipping - UK Seller! The Ironwood Gourmet salt cellar is constructed of gorgeous acacia wood, known for its unique and natural contrasting patterns. 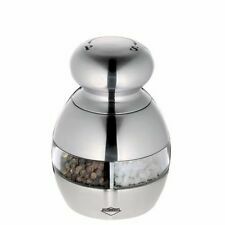 The salt cellar is perfect for housing sea or kosher salts, spices, and more! A convenient swivel top makes for easy accessibility while cooking and helps keep salts or spices fresher longer. This salt cellar measures approximately 4 x 2 ½ inches. Care Instructions: wash with warm soapy water - air dry. 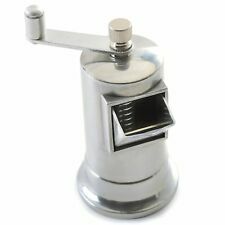 Exclusive coffee/pepper grinder from the 5th generation of historical coffee mill manufacturer. 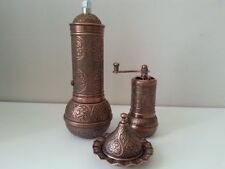 PEPPER, SALT, SPICE MILL. Turn the head for using the grinder. It is simple! Therefore rice can be used for the first grind. Acrylic, which is visuable, you can see the spice in the mill. Freshly ground, it's healthier than those processing spice. 304 stainless steel material, rustless, corrosion resistant, wear-resistant. High quality ceramic mechanism for great grind performance The mills have an embossed nut which is not just for decoration; the adjustment of this can help create the perfect grinding process for the user. Perfect for use in the Kitchen or at the Dining Table lifetime guarantee From the Range of Products from Tala . 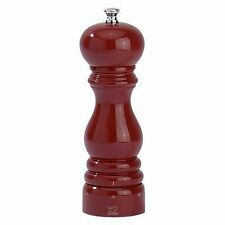 Cole & Mason Mini Cube Pepper Mill. 90mm . · The Salt and Pepper Set is made from durable, vitrified, super white porcelain. The Simplicity Collection is a comprehensive range of table and serve ware. Enjoy your preferred texture and flavour by adjusting the coarseness of the grains. Easy to use, simply push and hold the button dispenser to release a continuous flow of salt or pepper. 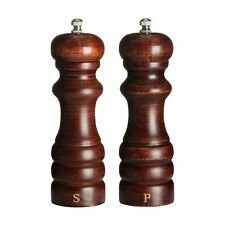 Electric Salt & Pepper Mills. BIA Salt & Peppers Shakers - Cow. BIA International has been crafting stoneware, porcelain dinnerware and bakeware for 60 years. Material: Porcelain with a glossy finish. Colour: White. Their products are available in a wide range of shapes and sizes to accommodate all your entertaining needs. 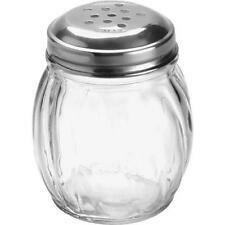 Your favorite gourmet salt will be easily accessible at the table or in the kitchen with our salt server. Durable stainless steel frame holds an 8 oz. glass bowl and features a unique flip top lid with silicone gasket to keep your salt fresh and dry. Dishwasher safe but we recommend hand washing.